MIRACLE MEAL™ is a complete, highly nutritious, all-natural soft food for birds and contains the correct balance of protein, carbohydrates and essential fatty acids necessary for proper growth, breeding and immune system functioning. MIRACLE MEAL™ is fortified with lactose-free whey protein and contains a full spectrum of vitamins, minerals and amino acids. MIRACLE MEAL™ is made from the highest quality human-grade food ingredients and contains no added starches, fillers or food dyes and is ethoxyquin free. 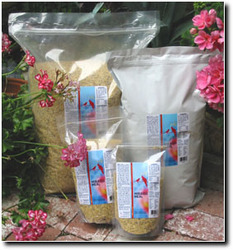 MIRACLE MEAL™ is recommended for birds in all stages of development and is especially useful during the breeding and molting seasons, and for raising young chicks. MIRACLE MEAL is a complete, highly nutritious, all-natural soft food for birds and contains the correct balance of protein, carbohydrates and essential fatty acids necessary for proper growth, breeding and immune system functioning. MIRACLE MEAL is fortified with lactose-free whey protein and contains a full spectrum of vitamins, minerals and amino acids. MIRACLE MEAL is made from the highest quality human-grade food ingredients and contains no added starches, fillers or food dyes and is ethoxyquin free. MIRACLE MEAL is recommended for birds in all stages of development and is especially useful during the breeding and molting seasons, and for raising young chicks.